Quoting French intelligence services, Le Figaro also said there are “calls to kill and be armed with guns to attack parliamentarians, the government, the officials of the executive and the police,”adding that the secret service reported these threats to the presidency. 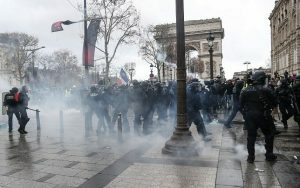 The police are facing tens of thousands of people who took to the streets today after the yellow jacket movement refused the presidential offers and went on for the fourth consecutive weekend of protests in France, some setting up barricades of fire and drawing tear gas from police, as they continue to pressure President Emmanuel Macron to roll back his economic overhauls. Today may be the most violent day ever recorded in France since the 1960s, and the results might be unpredictable.Yellow Vests protests are growing across France. However, French president Macron, supported by the EU elitists, will try to maintain his presidential position with the use of force and anti-democratic measures in the days and weeks ahead. Today, the future of French and European democracy is at stake. The wrong decisions could inevitably lead to martial law and wide civil unrest. Anger against the EU across France and Europe will reach new heights, symbolizing the end of this important institution built by the New World Order that is now reaching its end. Remember, criminals of the New World Order, the principle of national self- determination began with the French revolution, asserting the sovereignty of the people. It is the will of the people that make a state legitimate, not George Soros, not the EU, or Pope Francis. This is the beginning of the end for those who still believe in a Vatican New World Order in the hands of leftist perverts and technocrats. Gil Scott Heron was wrong, The Revolution Will Be Televised! 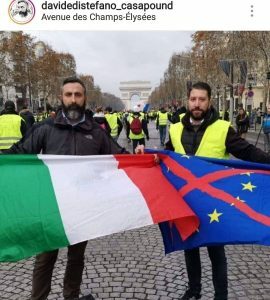 Representatives of Casa Pound Italy were also spotted in the protests in Paris.